Focus Features has released the official trailer for The Beguiled, the new film from director Sofia Coppola. Check out The Beguiled trailer in the player below! The Beguiled remake cast includes Golden Globe winner Colin Farrell (In Bruges, The Lobster), Academy Award winner Nicole Kidman (The Hours, Stoker), Emmy nominee Kirsten Dunst (Melancholia, Spider-Man) and Elle Fanning (The Neon Demon, Super 8). The Beguiled marks the fourth collaboration between Coppola and Dunst and the second between Coppola and Fanning. The script for the film is adapted by Coppola from Thomas Cullinan’s original novel of the same name. The Beguiled unfolds in a girls’ school in the state of Virginia in 1864. As the Civil War rages, The Miss Martha Farnsworth Seminary for Young Ladies has been sheltered from the outside world— until the day a wounded Union soldier is discovered nearby and taken in. Additional cast for The Beguiled include Oona Laurence (Pete’s Dragon, Bad Moms), Emma Howard (Transparent), Angourie Rice (The Nice Guys) and Addison Riecke (The Thundermans). 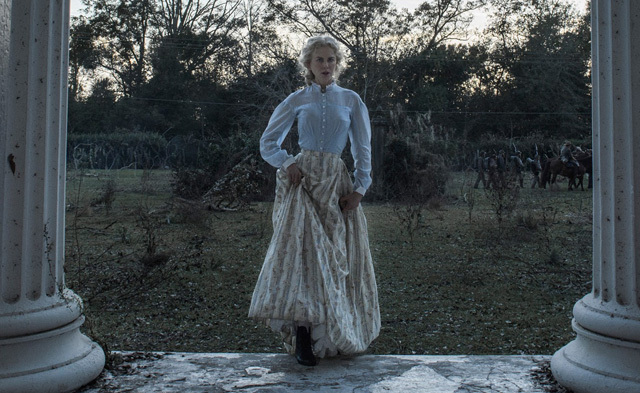 Anne Ross is serving as production designer on The Beguiled, marking her own fifth collaboration with Coppola. The film’s costume designer is Stacey Battat, (her fourth collaboration). The director of photography on The Beguiled is Academy Award nominee Philippe Le Sourd (The Grandmaster), and the movie is being shot on 35mm film. Focus will release The Beguiled domestically in select cities on June 23, 2017 in the U.S., with an expansion on June 30, 2017; and Universal Pictures International (UPI) will distribute the film globally, beginning in the summer of 2017.